The small game hunting season is a great way to get out and enjoy New Hampshire’s field and forests. Ruffed grouse, woodcock, snowshoe hare and squirrel are exciting to hunt. Ruffed grouse are the most sought after game bird in New Hampshire; the 2017-2018 NH Small Game Survey showed that 65% of hunting hours dedicated to small game went to hunting ruffed grouse, while woodcock accounted for 23% of hunter effort. In the spring of 2018, a total of 42 grouse drumming routes were completed and route data are summarized on the basis of five small game management regions. Grouse were most abundant in the Northern and Southwest regions of New Hampshire. In the spring of 2018, the number of drumming events heard per stop increased in the White Mountain, Central and Southwest regions. The long-term trends for grouse drumming surveys for each region and statewide can be viewed in the Small Game Summary Report . 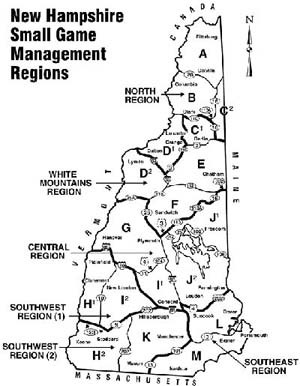 To track changes in grouse abundance on our premier grouse range New Hampshire has run 6-8 select drumming surveys routes in the North Country for the past 14 years. In 2018 the survey results show an average of .91 drumming events per stop for the North Country Index. This is an increase from the reported .88 drumming events heard per stop in 2017. The values routinely rise and fall. 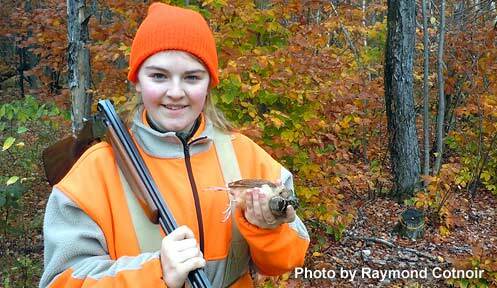 The North Country continues to have the most abundant grouse habitat in the state. Early reports indicate that we should have good production. Woodcock singing ground survey routes provide an index to the abundance of resident singing males and population trends. Woodcock density patterns varied throughout the state in 2018. To strengthen regional sample sizes 9 woodcock routes run for the small game project are merged with 11 existing woodcock routes run for the U.S. Fish and Wildlife Service. The number of woodcock heard per stop increased slightly in the Central and Southeast regions, decreased in the North, White Mountains and Southwest regions in 2018. The three March Nor’easters before the month was half over was cause for concern for early migrants. Long-term regional and statewide trends are depicted in the Small Game Summary Report . Snowshoe hare hunting season is long and offers hunting opportunity into March. The opportunities to hunt and view snowshoe hare are good in most of the state, but they are most abundant in the northern three counties where spruce-fir stands with dense understories are mixed with hardwoods. A research project is underway to provide insight on the influence of stand and landscape composition on snowshoe hare density and population fluctuation with a particular emphasis on high elevation and lowland habitat. We will share the results when they are available. Squirrel is another traditional small game animal. The gray squirrel is probably the most over-looked small game animal. They can be found in mature oak and beech stands where they forage for acorns and beech nuts. The squirrel season opens September 1 and runs through January 31 in all Wildlife Management Units. It is an excellent way to introduce a youngster or newcomer to hunting. Cottontail rabbit range remains fragmented and limited in New Hampshire. Certain areas are closed to the taking of cottontails to protect our remnant New England cottontail population. Be sure to note the closed areas for the taking of cottontails webpage. Cottontail season opens October 1 and runs through January 31 in Wildlife Management Units H2, K, L, M (except for closed areas). Have a safe and enjoyable fall hunting season.